I did like this particular slide from one of the three speakers I listened to today. 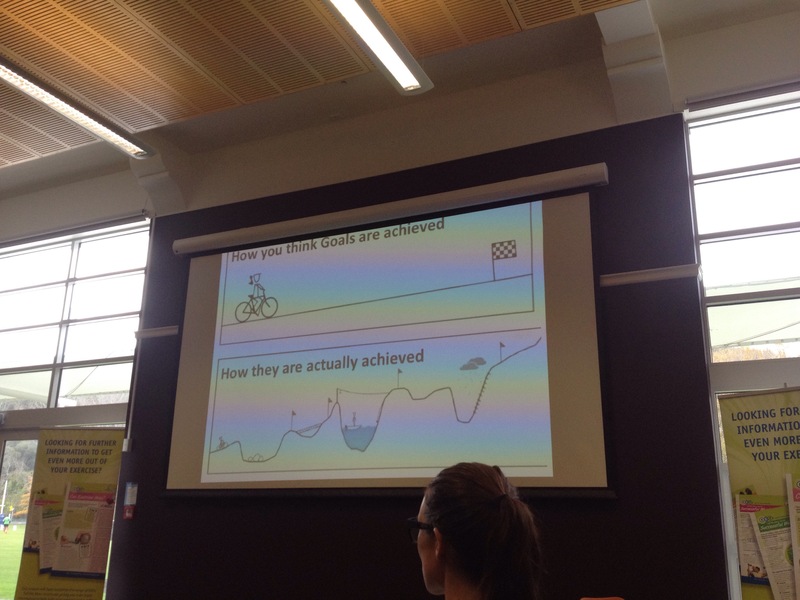 It beautifully illustrated the realistic path to our goals which many trainers forget about. I was quite surprised on a number of fronts. I was the only personal trainer from Southland who went today. There was actually only a small number of existing personal trainers, the majority of the people there were Otago Uni students. Of the personal trainers I spoke to (and I didn’t get to speak to absolutely all) I was the only freelance personal trainer. The rest worked out of gyms. I found that quite incredible. Then I reflected on my last few months with pride. One speaker asked the room why they wanted to be a personal trainer. Many actually didn’t have an answer. I have always made life and career choices born out of a personal passion and coaching is no different. I was actually approached by people and asked if I would coach, before I was even qualified, while still competing for Great Britain. So naturally, when I decided to retire from competition it was an obvious path. I love my job. I love the wonderful things my clients achieve, no matter how big or small. I love the fact that for the first time in my life for a long time, work doesn’t feel like work. There is a clear distinction here from a gym based personal trainer who is there simply to instruct. I don’t coach people to need me for ever, I coach you to be an inspired self sufficient person who achieves your dreams.